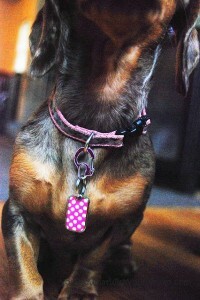 Last year I bought new ID tags for the dogs. Unfortunately, I had a brain fart and somehow combined my work phone number and S’s for the second contact. Since one number on the tag was correct I was lazy in getting them corrected or replaced. I had been eyeing the BlanketID tags as a replacement. We are digital people and I love that you can register the tag online so the person who finds your dog can access your information any time of night or day (instead of having to wait for business hours like with a microchip…which by the way is also a good idea). More than that though, these tags are super stylish! It does seem that all of the sudden the market is being flooded with tags with similar features. BUT all of the ones I have seen besides these have been big and ugly. 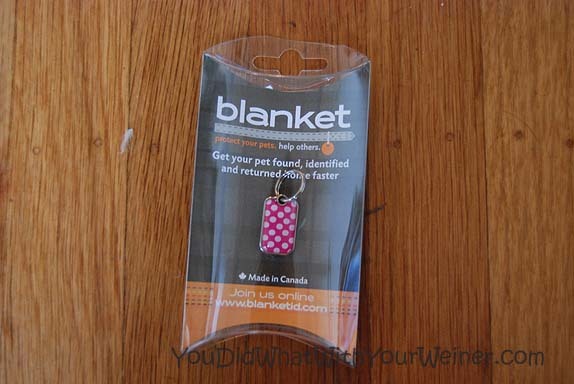 I finally contacted BlanketID and they enthusiastically agreed to send me a tag for review. I wanted one for Gretel too and, as luck would have it, DoggyLoot came out with a coupon for a BlanketID a couple of days later. The tags couldn’t come quick enough (can you tell by now that I am impatient when it comes to goodies in the mail? Ha, ha). I giddily skipped to the computer and created online profiles for Chester and Gretel as soon as they arrived. One of the coolest benefits of BlanketID is that a lost poster is created from the profile information you enter and stored online. If you report your pet lost, that poster is immediately sent to shelters and hospitals in the area that you lost them. The posters can also be printed to post around your neighborhood (but we sure hope we never have to use ours!). On the posters I mentioned that Chester has a scar on his belly and Gretel tends to get a left weepy eye. I also said that they had a microchip (although I didn’t post the number to deter people from registering my chip as their own and keeping them). I did have one big worry about the tags when I ordered them. 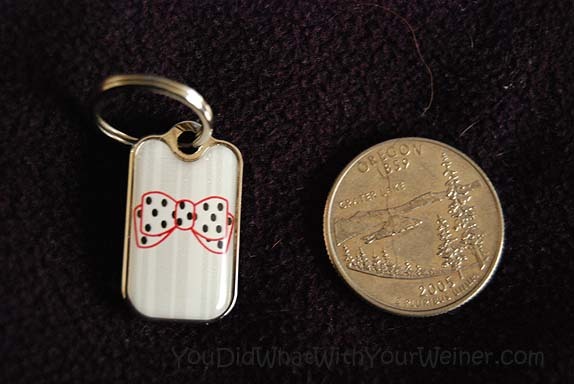 I was concerned that they would be too big for my short, stubby dogs and that they would drag on the ground or hit their legs when they were hiking. They are much smaller than I imagined though so it is not an issue. I will note that most of the designs are girly or gender neutral but they just came out with some new ones. The more “manly” ones are Dickey and Dapper (bowties), Dazzle and Twinkle (stars), Spangle (American flag), Maple (Canadian flag) and Jack (British flag). I will also caution you against using a “cute” photo of your pet on the profile. Choose a photo that would be the most useful to help the finder identify them. 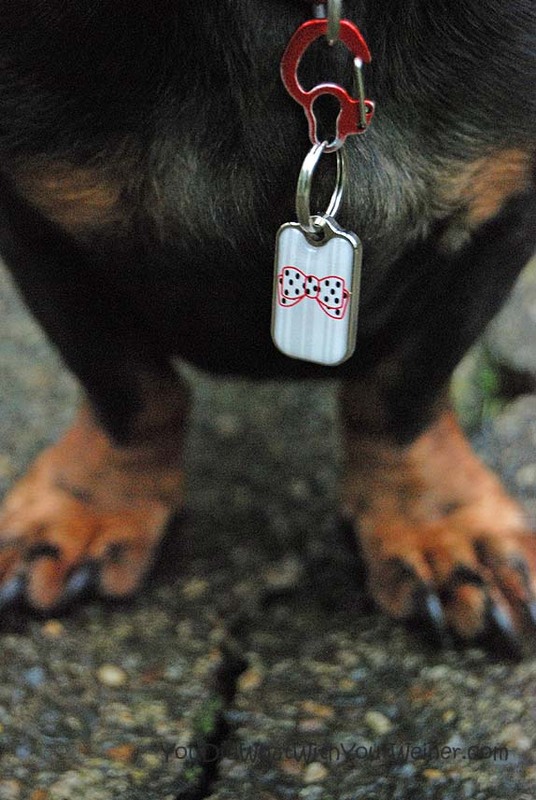 When your dog is lost, it is no time to show people just how cute fido can be. More than 15% of their profits go to the Blanket Fund for Animals which helps sick and abandoned animals get a second chance. 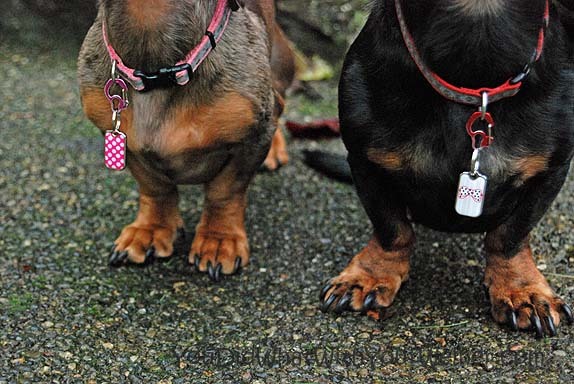 The tag is coated in an epoxy which means there is no “clanging” against other tags when they walk. You do have to pay an annual registration fee for the tag (which is nominal) so if you let your registration lapse the tag is useless. When you enter information into the profile, you don’t get to see where it shows up on the lost poster. It would be nice to see the poster visually fill as you type. When registering a second dog at a later date, the common fields like phone number and vet don’t auto populate. The process would be quicker and easier if it did. Don’t just take our word for it though. Check out the great reviews over at According to Gus and Barkzilla. We’re not hosting a giveaway this time (although we hear they may have something cool in store for us after the new year) but Pet Blogs United is. The contest is open until midnight EST December 12, 2011. You can enter here. Wow theses are stylish! We entered a contest on PBU for one! That is what I thought too about registering a microchip. Chester has one but when his old owner gave him to me, the paperwork got lost. We don’t talk to her much anymore and she lives out of state. I got the number scanned at the vet and found out it is an Avid microchip. I was able to register the number with my information on the Avid site by saying the previous owner was “unknown”. They may not all be like that but this one was. Just a word of caution. Great review! I like the size (for the same reason) I rarely wear a collar, but when I do…I like the tag to be lightweight, small and ofcourse nice-looking.